With the rain pouring down outside to the extent that there are something like 80 flood warnings in place and reports of flash floods in the midlands/warwickshire on the radio, I've opted to stay indoors today. Dave is somewhere on a campsite near London, for the last Maelstrom event of the year (and hopefully dry enough) so after spending the morning doing chores, I decided to spend the afternoon spinning. While I was away on holiday, my spinning wheel went to stay with Chris from the Wednesday knitting group who proceeded to happily spin up every bit of fluff in her house. From her reports, I know the wheel not only spins, it spins very well, so any inadequacy in the spinning department is purely down to me and not the tools at hand. Feeling full of optimism I got the wheel out of its corner, dusted it down and fetched some odds and ends of merino Kellie gave me when she did the spinning workshop a few months back. Next I sat practicing treadling for a good 20 minutes until I was sure I could keep the wheel moving smoothly for a long period of time without paying too much attention. What can I say at this point, other than that while this attempt wasn't a disaster, I wouldn't call it a success either. The wheel definitely works. It takes up the fleece and spins it, but my technique is sadly lacking, with the main problem area being drafting. I had suspected this might be the case before I started, but it soon became obvious that I couldn't draw fibres out of the merino top fast enough to satisfy the wheel. 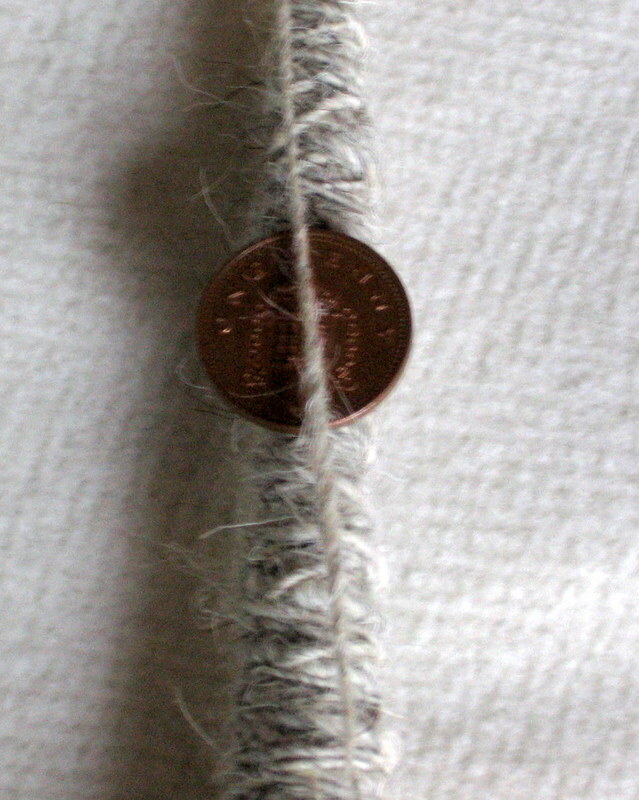 The fibre I was drafting was too thin and in my efforts to get enough twist into it by holding back before allowing the twist to travel into more fibre, meant it would snap. 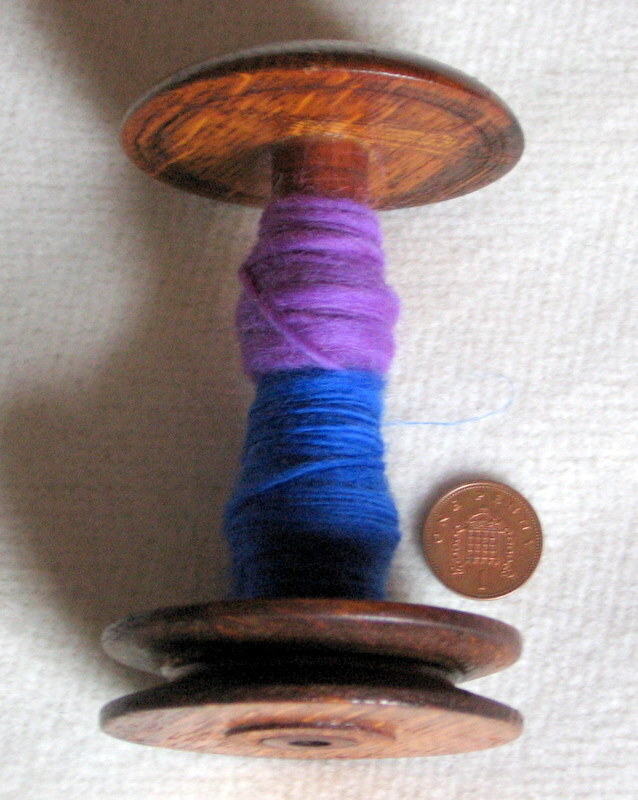 Not waiting until I'd spun a good bit of twist into the fibre, meant the bobbin took up the yarn but it was woefully underspun. Examining it after each snapping incident as I pulled it back off the bobbin to try again, revealed it had no strength and would pull apart if put under tension because of the lack of twist... Which of course would mean it was prone to snapping. 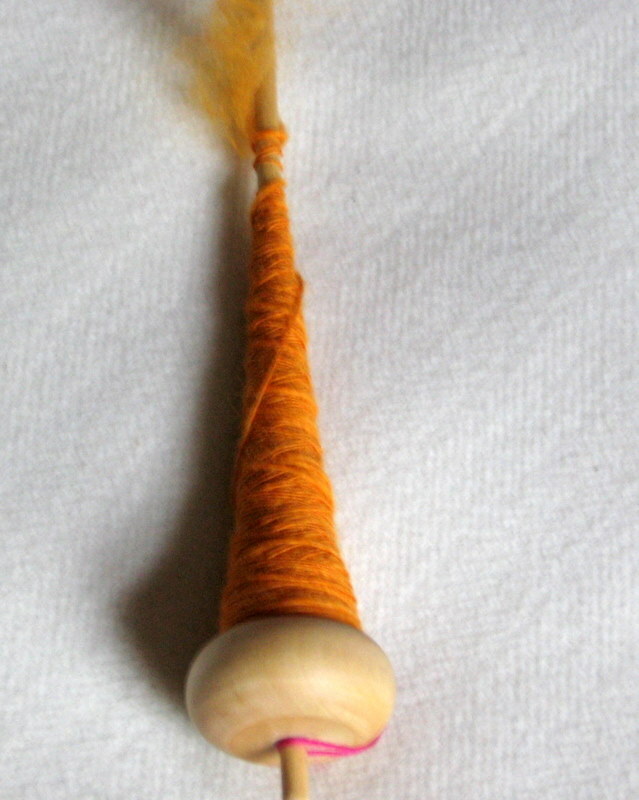 This reminded me very much of my first few goes with the spindle actually - there the spun single couldn't support the weight of the spindle which would stretch out the underspun yarn until it dropped to the floor. The trick if it started to happen with the spindle was to spin the spindle which would put more twist into the spun thread and stop the problem in its tracks. Of course, putting enough twist in in the first place means this doesn't happen and so I haven't seen it in the spindle since those first few attempts... So perhaps I'm being overly critical of my first real go at using the wheel? After an hour and a half, this was the sum total of yarn spun up and I wouldn't even guarantee that the single that's there is going to be any good if I tried to wind it off. 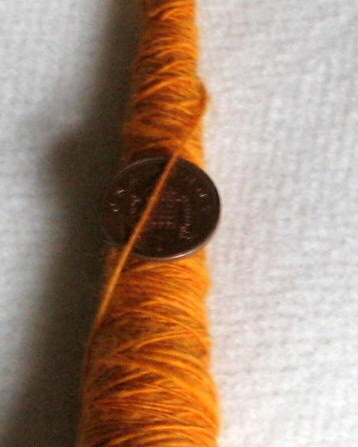 Either way, I think I need to find a supply of cheap but easily spun fibre to practice on before going any further. 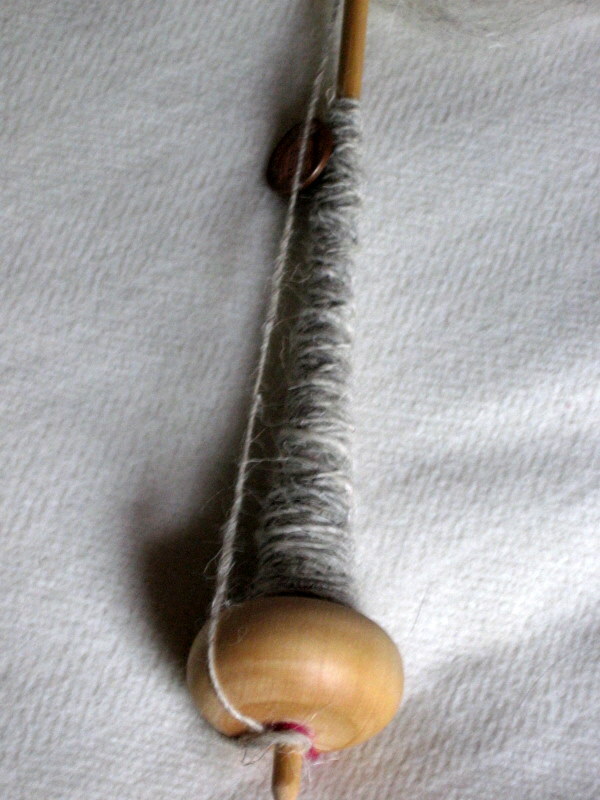 And started spinning up the Grey Swaledale I picked up when I bought the spindle. Very nice and just the kind of confidence builder I needed. A wheel does take a while to get used to and I'm sure I will need to relearn when I get mine out again but you will get there and your spindle stuff looks great. Hope to get my wheel out once the back is straight and we are getting close to that Honest! !